Agbil Settlement in Quba region of Azerbaijan known for its three medieval period mausoleums. All of the three mausoleums belong to the 16 century and are located in old cemetery of the settlement. While, the local people call them Pirs (Sacred people) of Agbil or Four Agbil (which shows there were actually more Mausoleums), but in literature, the authors refer the mausoleums as Sheikh Maziyyad Mausoleum with the name of the biggest one remains to date. 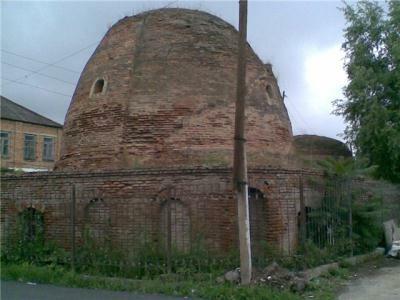 The first mausoleum built in 1553, also known as Mausoleum of Shah Murad, was completely destroyed. It is believed that the mausoleum was 2.7×2.7 meters in diameter. The second mausoleum is surviving to date. It has a traditional rectangular structure. Particularly, the third mausoleum is very different. It has a square floor plan with the size of 2.8×2.8 meters on the inside. The entrance of the mausoleum is very original and looks to the the southern side. Its original architecture and design shows the importance of it among all three. The small square construction from burnt bricks placed in an octagonal stone pillar and this unique mausoleum has octahedron design from outside with a high dome and wide portal entrance while from the inside it is a usual square room. As a matter of fact, Johannes Albrecht Bernhard Dorn- German orientalist, who studied these mausoleums in the 19th century, noted the inscription written on them. The translation from the Arabic was: “Oh my people, do not lose your hope for the mercy of mighty Allah. Indeed, He forgives all the sins. He is the most forgiving and most merciful. We built this for the son of the sultan, Sultan Khalilullah. May Allah forever save his state and happiness. Shah Murad Sheikh Mazyad Khaja Sheikh Bayazid – may Allah forgive him and all the followers. On the year of “nine hundred and forty-four” (1533–1534). Want to explore Quba region? Then, join to our Quba- Khinalyg tour to explore the hidden gems of Azerbaijan.